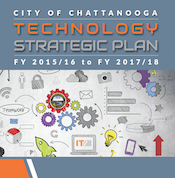 The Department of Information Technology (DIT) is a vital component to all departments and agencies throughout the City of Chattanooga by providing strategy, planning, project management, business analysis, implementation, maintenance, and security of all technology across the City. DIT consists of the following divisions. The day-to-day running of the department, department finances, budgeting, and strategic planning. Responsible for applications management, systems and software engineering, including web development. Systems deployment & maintenance (hardware), network engineering & infrastructure operations are all part of this division's responsibilities. The PMO manages the IT project portfolio, provides general project management for the department, and technology-related business analysis for the City. The IT service desk is the front-line intake point for all things IT. The service desk handles all requests for service and deployments of technology equipment city-wide. To serve as the catalyst for digital transformation and innovation. To be the value-driven steward of information systems and innovation for the City of Chattanooga. We adhere to standards of ethical conduct and are accountable for our actions and work quality. We are honored and proud to serve the City of Chattanooga and strive to provide the best service model we can. We seek to be excellent in all that we do. Technology solutions that have a satisfactory return on investment and provide the best value to the City of Chattanooga will be deployed. Business processes should be evaluated for reengineering opportunities where applicable and before they are automated. We will work S.M.A.R.T.E.R. regarding all technology-related initiatives; they will be Specific, Measurable, Attainable, Relevant, Time-constrained, Evaluated, and when appropriate Reevaluated to provide the best value possible. Common standards and shared information will be used as a basis for technology decisions. We will maintain a pro-active approach to technology and innovation within the City. Exploit functional commonality and sharing of data across organizational boundaries when implementing new technologies and business applications, and when possible, strive to capture data once and centralize common services in order to avoid higher costs, duplications of effort, and potential for any error. A partnership, an attitude of collaboration and cooperation will be fostered with all City departments, EPB, Hamilton County, and all other appropriate service organizations in our area of influence when providing services to community stakeholders in order to maximize the use of taxpayer dollars and, as much as possible, provide seamless interaction in delivering governmental technology-related services.